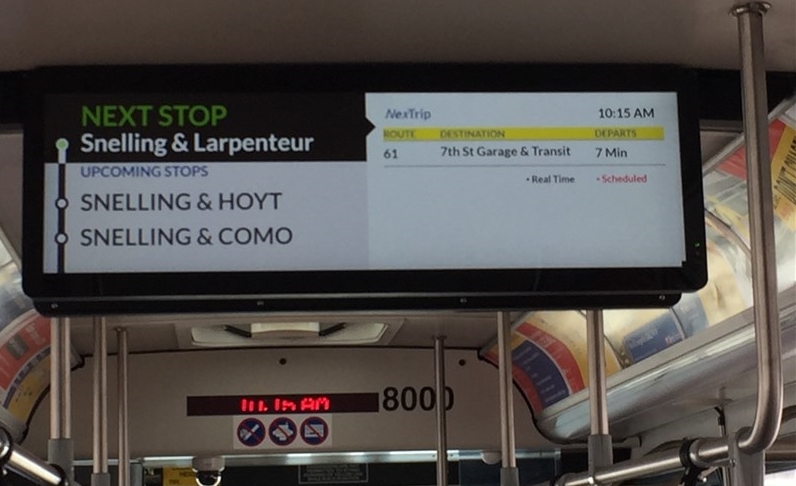 Starting today, new digital displays on A Line buses will provide real-time information about upcoming stops, connecting routes and service alerts. The displays have been installed so customers can make informed decisions as they ride. For example, if the displays indicate that the Green Line is delayed, a customer could continue to Grand Avenue and transfer to Route 63 to get to downtown St. Paul. There are nearly a dozen routes that connect with the A Line, which travels on Snelling Avenue, Ford Parkway and 46th Street. “This saves the customer time and the inconvenience of an unexpected wait time for a connecting route,” Technology Systems Manager Gary Nyberg said. Each bus is equipped with two displays – one attached to the ceiling, just in front of the rear door, and another on the storage compartment behind the operator. The displays have a similar look and feel of the NexTrip feature on Metro Transit’s app and website. Each of the A Line's 13 buses are now outfitted with the screens. Metro Transit hopes to learn more about how the system works and what kind of information customers most want. In the future, the displays could be used to show safety and emergency messages, information about upcoming events, or to advertise businesses along the route. Provide feedback by contacting Customer Relations.